Legends of the Wild is excited to announce its collaboration with Last Frontiers Trekking Ltd. and Global Primates Network (GPN) in presenting a series of Snow Leopard Camera Trap Research expeditions in the Annapurna mountain range in Nepal. We give our clients the opportunity to accompany Tashi Ghale, a field biologist with GPN, on a camera trap survey expedition aimed at calculating the population density of snow leopards in the Limi Valley of Annapurna’s Humla District. Over the course of the journey, participants will visit up to six of Tashi’s camera trap sites to recover memory cards and subsequently download image and video data. Photos and video obtained from the camera traps enable GPN to estimate the number of snow leopards inhabiting specific mountain tracks, in addition to the felines’ travel routes and the movement of their prey. Scientists rely on the animals’ spot patterns to identify individual snow leopards when conducting such research. Tashi Ghale’s snow leopard camera trap research is recognized as being amongst the most prolific in its field today. Each of the expeditions - from arrival in Kathmandu to final departure - will last ten days, five of which will be spent in the company of our field biologist. Our trekking itineraries will range in altitude from 3,500 to 4,500 meters. These unique journeys have been conceived with two objectives: to allow participants to witness, first-hand, compelling wildlife conservation field research against a spectacular Himalayan setting and to provide funding support for GPN’s ongoing mission to protect the future of snow leopards in Annapurna through scientific research and community outreach programs. Participants on the journey will see the tangible application of the funding provided by the expedition to GPN to support its snow leopard conservation efforts. GPN, founded in 2008 by a team of young wildlife researchers to promote the science-based conservation of wildlife and its habitat in Nepal, endeavors to protect wildlife through ‘people participation’ by developing and promoting local ‘citizen scientists’ through training and skill development programs. GPN works to engage communities – including migratory yak and goat herders - in field research through credible scientific data collection as well as by promoting awareness of snow leopard and alpine ecosystems. Tashi Ghale today manages 30 different camera traps in the Manang area, across a dozen sites located along mountain ridges, at elevations ranging from 3,800 to 5,500 meters. 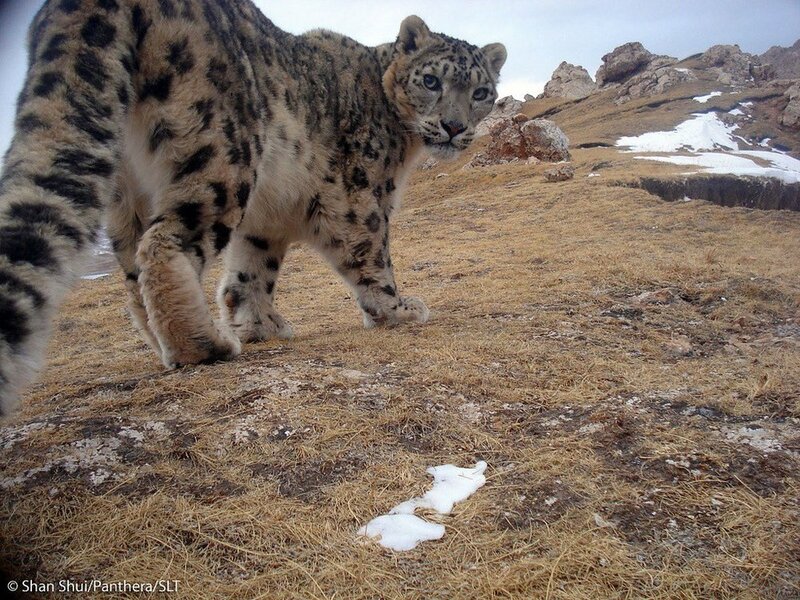 Tashi started his snow leopard camera trap research in 2006, working with a self-customized analog camera. Today his digital cameras are capable of capturing photo and video data, day and night. He estimates that there are currently 25-30 snow leopards living in the area around Manang and 300-500 throughout the mountains of Nepal. The snow leopard has for many years been referred to as the ‘mountain ghost’ as a result of its elusive nature and extremely infrequent sightings. One of the most iconic of the world’s apex predators, it remains the least understood of the big cats. It is estimated today that there are between 4,500 and 10,000 snow leopards living in the wild, across a dozen Central Asian countries at altitudes ranging from 2,500 to 5,500 meters. The snow leopard, whose population is believed to have declined by 20% since the turn of the century, is categorized as ‘Endangered’ on the International Union for the Conservation of Nature (IUCN) Red List of Threatened Species. The greatest threat today to the feline is human-snow leopard conflict. The animals are killed, with greater frequency, by humans in retaliation for their preying on livestock, which is increasingly populating snow leopard habitat. Guests will be welcomed at Tribhuvan Airport then transferred to the Marshyangdi Hotel, located in the Thamel district in central Kathmandu. Over dinner, we will discuss highlights of our upcoming journey. Day 2: Overland from Kathmandu to Chame (approx. 10 hours). Early morning, we start our overland journey to Manang. We will cover the initial Kathmandu to Chame segment of the voyage, driving along well-traveled highways and secondary roads. Dinner and overnight at Chame. Day 3: Jeep transport from Chame to Manang (approx. 5 hours). Throughout most of the day, our jeep convoy will climb the twisting, arduous mountain trail ascending from Chame (2,650 meters) to Manang (3,500 meters). We will arrive in Manang in mid-afternoon, after a lunch break along the road. Our home in Manang will be the Mountain Lake Lodge where in the evenings, around the warm wood-stove, Tashi will share with us his unique experience and insight as well as the many fascinating photos and videos he has captured of the legendary snow leopard. Days 4-8: Tracking the snow leopard. Over the next five days we will accompany Tashi Ghale on a series of trekking excursions to collect data from up to six of his camera traps set along ridge-lines in the Manang area. Sites we will visit include Khangsar (3,800 meters), Yak Kharka (4,000 meters) and Ledar (4,200 meters). We will overnight at least once along the trail as Tashi seeks interaction with communities of migrant yak herders who today represent the most frequent point of conflict between humans and snow leopards. A large part of Tashi’s (and GPN’s) work today involves the creation of viable alternatives – to the killing of snow leopards – for the benefit of the yak herders to safeguard their livestock. Such alternatives include the construction of portable ‘safe’ corrals for young livestock as well as the supply and use of ‘fox-lights’ to discourage snow leopards from approaching herders’ encampments. Much of the funding provided by our expeditions will be allocated to the acquisition of such tools – ‘safe’ corrals and ‘fox-lights’ – to assist GPN is its efforts to reverse the trend of snow leopard retaliatory killings. As we make our way along the trail, it will be difficult not to be amazed by the collage of crystal-clear alpine rivers, jagged snow covered Himalayan peaks, Buddhist monasteries and monuments and ancient stone villages. Surrounded by the Annapurna mountain range – which includes one peak over 8,000 meters and thirteen peaks over 7,000 meters – we are reminded that we truly are on the roof of the world. Day 9: Return journey from Manang to Besisahar (approx. 8 hours). Our jeep descent of the storied mountain road will be somewhat more comfortable and rapid than the ascent. At the base of the trail we will have dinner and will overnight at the Gateway Himalaya Resort in Besisahar. Day 10: Overland from Besisahar to Kathmandu (approx. 6 hours). The Nepalese highway system will feel like 5-star comfort after our mountain ‘off-road’ experience! Closing group dinner in Kathmandu followed by overnight at the Marshyangdi Hotel. Day 11: Optional trip extension to visit sites in the Kathmandu valley or transfer to and departure from Tribhuvan Airport. To join our upcoming Snow Leopard Expedition please contact us using the form below. Costs Included: All airport/hotel transfers. All accommodations including hotels in Kathmandu (2 nights), Chame, Manang and Besisahar as well as overnights along the trail. Dinner (2) and breakfast (2) in Kathmandu plus all meals once trip starts. All regional fees and permits. Expedition and Naturalist guides. Costs not Included: International Flights. Airport taxes and Nepal entry fees. Personal gear and excess baggage charges. Required Insurance Coverage (medical and rescue/repatriation). Costs incurred as a result of delays and events beyond the control of Legends of the Wild. Equipment: We will supply a specific and detailed clothing and equipment list several months before departure. Sign up with your email address to receive the very latest news and updates from Legends of the Wild.